McAllen - Simona Medina Santiago entered eternal rest on Thursday, April 26, 2018 surrounded by her family at her residence in McAllen. Simona was born on January 5, 1935 in Mexico to Jose de la Luz Medina and Valentina Picasso Medina. 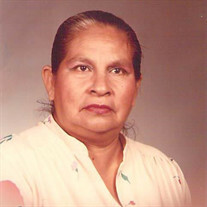 She was a lifelong resident of McAllen and a member of San Juan Diego Catholic Church. Simona was strong in her catholic faith and her God. She would help out her church in anything and everything. She was a catholic cursillista. Simona enjoyed music and dancing, above all her greatest love and joy were her children and grandchildren. She was happily married for 51 years to HER CHOSEN ONE Mr. Severiano Santiago. She was preceded in death by her parents and all her siblings. Left to cherish her memory is her husband: Severiano Santiago; her children: Marta A. Castro, Mario A. Santiago, Maria A. Santiago, Adela Santiago, Francisco X. Santiago and Simon A. Santiago; 11 grandchildren and six great-grandchildren.